Originally from Palmerston North, Andrew Atkins attended Central Normal School, Intermediate Normal School and Palmerston North Boys High School. Barry Jones was his first teacher and Guy Donaldson his second teacher in Palmerston North; he completed his ATCL recital diploma with Distinction under Guy's tuition. He went on to study at the New Zealand School of Music in Wellington, where he has just completed a Masters in Classical Performance Piano. He performed Beethoven's 2nd piano concerto with the Sinfonia in 2013. His conducting experience includes the Virtuoso Strings, the Tawa Local Orchestra, and the Wellington College/Wellington Girls College/Wellington East Girls College combined school orchestra. 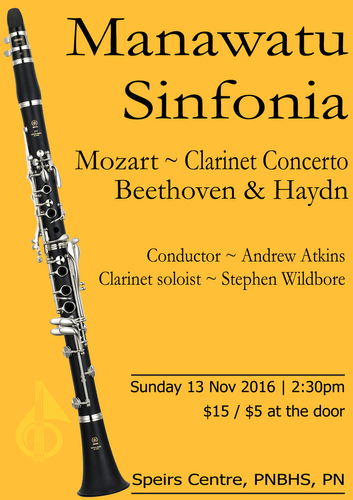 He recently conducted the Kapiti Concert Orchestra for their August concert with NZSO Oboe Soloist Peter Dykes.